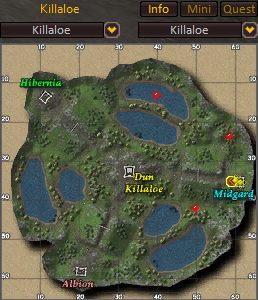 BG quests in each BG follow the same idea of 3 quests to either kill x amount of mobs, or run to a certain location. 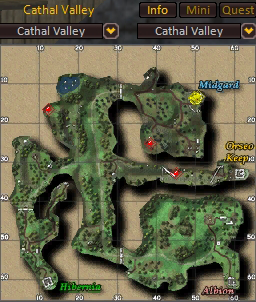 Use your /map as the locations are marked on the map with a red dot. You can get the 3 quests together and do a run, turning in each 3 at the same time. You'll receive more experience for turning in these quests at lower levels, but the experience at the last level for the BG is still amazing. 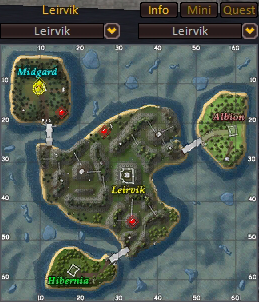 For example, in Leirvik at level 40, you might only need to run these once to ding 42, but at 44 you might need to do them 2 or 3 times, at most, to ding 45. It's still very fast, and very easy leveling. These quests give you Bounty Points along with experience. You can also get other quests in the BG to kill realm enemies and obtain the highest realm rank for that BG, this is great in the more populated BGs like Molvik, Thidranki and Cathal Valley. BGs also have a Realm Enhancement NPC for buffs, a Hastener and the higher level ones have a water breath NPC and a Siege merchant. There is also a BP merchant where you can buy gear with BPs. Be aware! You are in a RvR zone and while some BGs are not as popular as others, you still run the risk of being ganked while killing mobs, so be on your guard! Quests are obtained from a NPC inside the main portal keeps and named below. Please note the NPC names are colored by Realm i.e. red for Albion's NPC, green for Hibernia's NPC, and blue for Midgard's NPC. Speak with Captain Hayworth/Captain Leanna/Captain Kynja and accept all 3 quests offered. 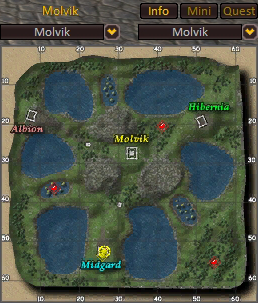 Your map highlights the locations of each of those mobs. If you want, you can chain one (or two) quest(s) over and over if the location(s) suits you and you don't feel like running around to all 3. Speak with Captain Circa/Captain Cody/Captain Astridr and accept all 3 quests offered. Speak with Captain Maynard/Captain Rebma/Captain Gherimi and accept all 3 quests offered. Speak with Captain Maiales/Captain Deneth/Captain Grattir and accept all 3 quests offered. Speak with Captain Martare/Captain Raldir/Captain Illairer and accept all 3 quests offered. Speak with Captain Peliane/Captain Lunilmar/Captain Kormarg and accept all 3 quests offered. 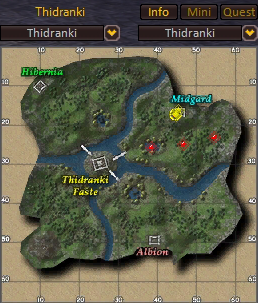 Your map highlights the locations of each of those mobs/the Outpost. 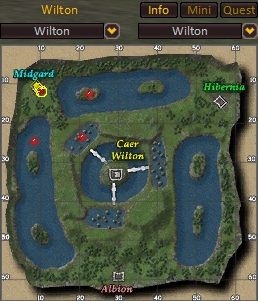 If you want, you can chain one (or two) quest(s) over and over if the location(s) suits you and you don't feel like running around to all 3. Speak with Captain Osezel/Captain Fallorisse/Captain Talmeri and accept all 3 quests offered. 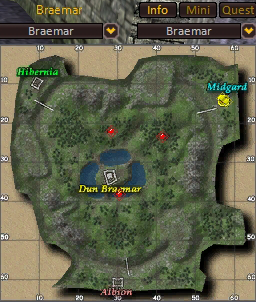 If you're doing these BG's to level - they are really the easiest and fastest way to level - you can stop after Leirvik and head to ToA and do the quests in Aerus.